From holidays to anniversaries, birthdays to baby showers, it seems there is always an upcoming event requiring a gift. We all want to give our loved ones something memorable and meaningful, but choosing a unique and heartfelt gift is often expensive and time-consuming. Luckily, your Instax prints offer the perfect opportunity for dozens of creative, hand-made keepsakes. Instead of letting your photos gather dust in a drawer, show your loved ones how much you cherish your shared memories with do-it-yourself Instax gifts. To help you in your next gifting endeavour, we’ve rounded up three of our favourite DIY projects using Instax photos. Best of all, these projects are so simple you could knock them out in one afternoon. So what are you waiting for? Let’s get crafting! Why we love it: This project can be completed in a matter of minutes, and looks great. You can use ornate ribbon or a simple piece of twine depending on your gift recipient's personal style. Measure out 75 centimeters of string or ribbon and cut. 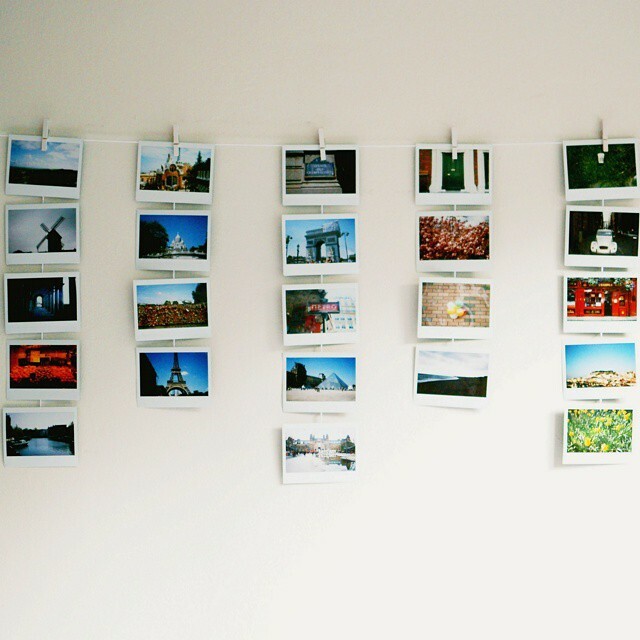 If you’d like to display more than 10 Instax photos on your banner, keep in mind each photo is about 13 cm wide; plan the measurement of your material accordingly. 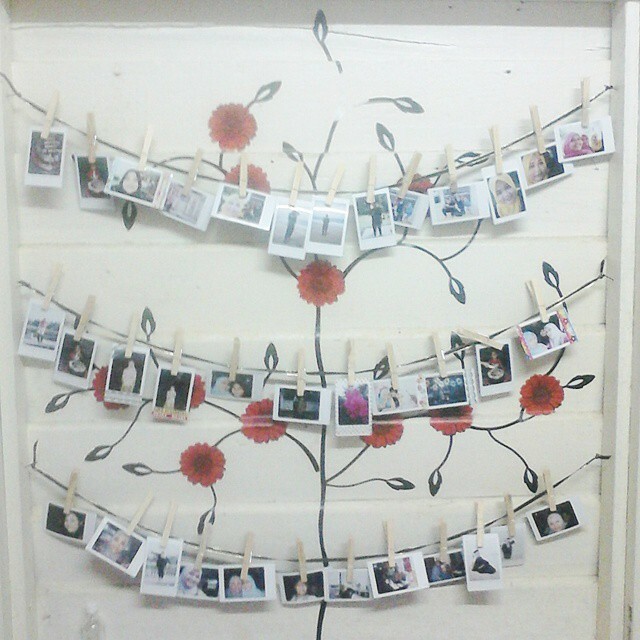 Then, using the clothespins, clip your first Instax photo on the end of the string and continue with the rest of your photos. Leave about an inch of space between each print. When complete, the banner can be hung across a mantle, doorway or tacked to a wall for easy photo viewing. To save even more time, Instax Photo pegs are also available as an alternative of attaching your images to the ribbon or twine. Why we love it: Not only is this project easy, but it can be personalised and looks great in any home or office. First you’ll need to determine if you’ll be making one multi-row photo ledge or one long row. Multi-row photo ledges are a great way to fill up space on a blank wall but, for areas with many other decorations, a single row shelf may be more appropriate. Each piece of plastic cap molding is around eight feet long, for multi-row shelves, cut your plastic cap molding into four two foot long strips. For a single long row, we’d recommend only four to six feet of cap molding. For additional flair, add craft paint, glitter or paste on a few beads. Colour your shelf solid or, for the especially crafty, add a fun design. Place your adhesive strips along the back of the cap molding, spacing each strip evenly and not removing the protective paper from the wall-facing side of the adhesive. When you’re finished, simply package your photo ledge along with a few of your favorite Instax photos so your pal can display their new decor immediately. Why we love it: This project is easy, inexpensive and gives you an opportunity to create something your friends and family can use every day. Start by measuring and marking an area of mat board so it matches the dimensions of your Instax photo, with a little bit of room around the edges. Each Instax photo is 54 (W) x 86 (H) mm. Once you have measured out the backing for your Instax photos, use an X-acto knife to precisely slice each square of mat board. Then, use paste or Modge Podge Dimensional Glaze on the back of your Instax photo to attach it to the mat board. Once the glaze or paste has dried, coat the front of your image with Modge Podge Dimensional Glaze to seal the photo onto the mat board and give the photos a raised, glossy finish. To ensure sure dust and debris don’t get trapped in the glaze, place drying images under a bowl or another domed surface. Also, to avoid unsightly pockets, use the needle to pop any air bubbles before the glaze dries. Finally, cut strips of magnetic tape and attach them to the back of each image by removing the paper covering the adhesive. If you cannot find adhesive magnetic tape, you can also use a hot glue gun or a few drops of Superglue to attach non-adhesive magnets to the back of each image. Present these magnets in a storage tin or keepsake box for easy storage. 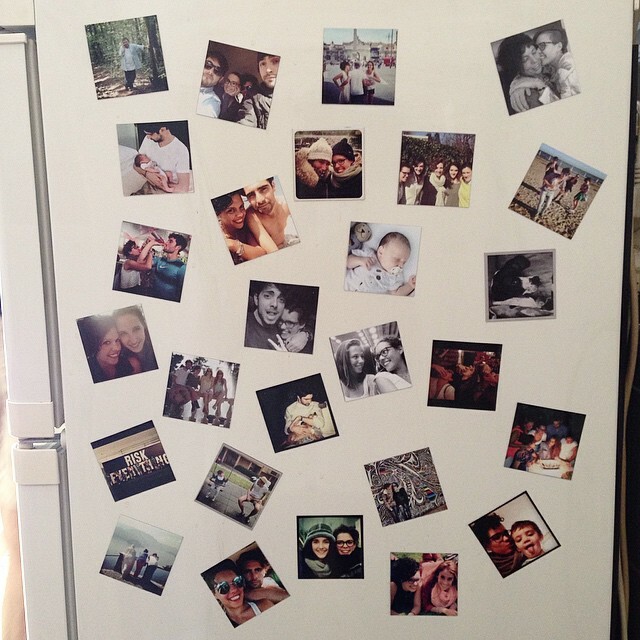 Your friend will love attaching their new one-of-a-kind magnets to refrigerators, filing cabinets, note-boards or any other surface in need of personal flare. Of course, no matter which project you choose, your friend or family member will be thrilled to open a handmade gift. Instead of spending a fortune and stressing over the perfect gift, give you loved ones an originally DIY photo gift they can proudly display for years to come. Do you have a favorite Instax DIY project? Share it with us in the comments section below, or let us know on Facebook!